Cheesecake is one of my absolute favorite desserts. It is so delicious and indulgent, it’s pretty irresistible. The problem for me is that I find a regular cheesecake far too large to have around the house because I, in fact, cannot resist it. 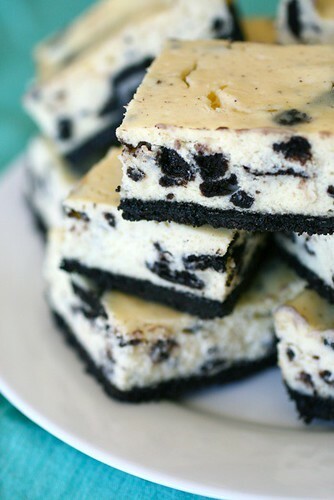 These cheesecake bars are the perfect solution because you can still have all the deliciousness of cheesecake, but in a much more manageable serving. Also, they are easier to unload on friends and family since they are so portable :) I made these in a 8 x 8″ pan but the recipe can be easily doubled in a 9 x 13″ dish. Preheat the oven to 325˚ F. Line an 8 x 8-inch baking dish with foil. To make the crust, place the Oreos in the bowl of a food processor. Process, pulsing, until the cookies are finely ground. Add in the melted butter and pulse until the cookie crumbs are moistened. Transfer the mixture to the prepared baking pan. Press the crumbs into an even layer over the bottom of the pan. Bake the crust for 10 minutes, then set aside and prepare the filling while maintaining the oven temperature. To make the filling, add the cream cheese to the bowl of an electric mixer fitted with the paddle attachment. Beat on medium-high speed until light and smooth, about 2 minutes. Mix in the sugar until well combined. Blend in the sour cream, vanilla and salt. Beat in the egg and egg yolk on medium-high speed until incorporated, scraping down the bowl as needed. Stir in the chopped Oreos with a rubber spatula.